Dear friends, I hope you all had a wonderful Christmas season and are looking forward to 2018! Whatever your plans and dreams for the next year, I pray the Lord would bless and keep you, and that you would glorify and enjoy Him even more richly than before. 🙂 My family and I have had … Continue reading Thank you for a great 2017! Hunting in the Highlands is LIVE on Kindle! Happy 1st day of the last month of the year! How has 2017 flown so fast? ... What would you say is your favourite event or memory of the year so far? 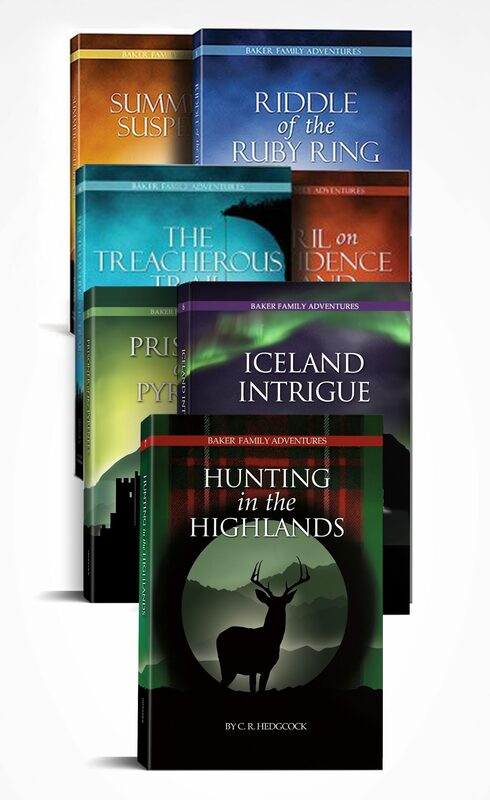 Because it's the 1st of December, that also means it's the first day that Baker Family Adventures: Hunting in the Highlands is available … Continue reading Hunting in the Highlands is LIVE on Kindle! Baker 7 Title and Cover … Revealed! Ladies and gentlemen, boys and girls, this is the moment you've been waiting for. Over the past weeks, you’ve made some excellent guesses at the cover design, and one of you even told me what you thought the title would be! Who was wrong? Who was right? And what kind of adventure do the Bakers … Continue reading Baker 7 Title and Cover … Revealed! Remember the giveaway of 2 copies of the Bakers' brand-new adventure in Scotland? There's good news -- given the amount of interest in the giveaway, we've decided to add an extra copy of Baker #7! So now there are THREE copies to be given away; two to US entrants, and one to UK entrants! The … Continue reading Update: Giveaway Time! Subscribe to the newsletter so you don’t miss out! “This book is thoroughly engaging and adventurous. I couldn't put it down! The novel kept me guessing from cover to cover. I felt like I was part of the story. If you are a person who loves mystery, you will definitely love this book.” - Rebekah J. “Peril on Providence Island has everything needed for a good adventure. Travel, suspense, danger, treasure, thieves, and mystery bring this story to life in merry old England. Character lessons, godliness and Biblical lessons are included in this wonderful series about a Christian homeschooling family that often finds themselves in precarious situations. This series can be used as a read aloud for the entire family or read independently for 10 and up.” - Diane K.
A signed book makes a wonderfully unique gift! Copyright © 2018 C.R. Hedgcock All Rights Reserved.